With this kit, an ultra-high head of a maximum 254 m can be obtained. Tsurumi Manufacturing Co., Ltd. was founded in Japan in 1924, and has since been manufacturing, purchasing and selling various pumps and related equipment, with a strong focus on submersible pumps. The company has recently introduced its Tandem Kit, which exhibits power in fields where high head is required, such as mines, and construction and tunnel work sites. Generally, in applications that need draining at high head such as mines, it is necessary to prepare an expensive pump of a large size that provides high enough output to satisfy the required specifications by itself, or to make a sump pit as a relay point. Particularly, when it comes to draining water from mines, there is a limitation on installation space. Therefore, in such a case, a pump of compact and slim design is required. For this purpose, Tsurumi developed the dedicated Tandem Kit, which is attached to the casing of the LH and LH-W series pumps that feature high head, high durability and slim design, and have been proven in mine drainage applications. With the Tandem Kit, two pumps of the same model can be easily connected in series. Tandem operation that connects two pumps in series can provide twice the total head of a single pump at a fixed flow rate. The operating principle of this method is the same as that of a multi-stage pump. LH23.0W with Tandem Kit, which features high head, high durability and a slim design. 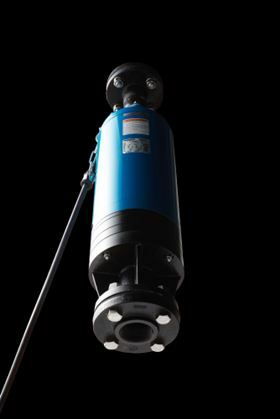 Tsurumi has six 3-30 kW pumps that are applicable with the Tandem Kit. Most of these pumps have a dual impeller design. The Tandem Kit can be easily attached to the pumps at the work site. With this kit, an ultra-high head of a maximum 254 m can be obtained. A head of 400 m is possible with optional features. In many cases of tandem operation, pump models equipped with pressure relief ports are selected, in order to prevent discharge pressure from being directly applied to mechanical seals. Tandem operation that connects two pumps in series can provide twice the total head of a single pump at a fixed flow rate. Tsurumi offers a variety of heavy-duty, highly reliable pumps that enable continuous operation under the strenuous conditions found in mines, etc. Also available as options are submersible pumps for high-temperature liquids that can handle water of up to 90°C and all stainless steel pumps, in which all liquid contact parts are made of stainless steel (316 stainless steel).